The COMELEC proclaimed the 12 winning senators in the just-concluded May 9 elections. Of the 12 winners, five are neophytes, four have been former senators, and three are reelectionists. 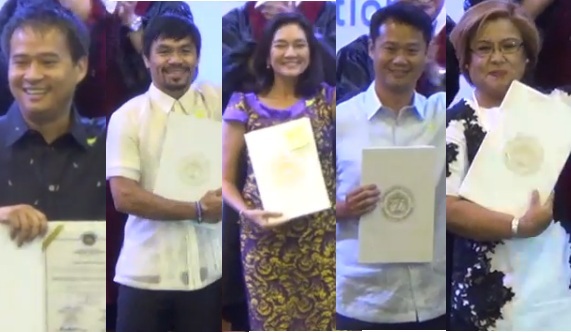 The new senators are ex-TESDA director Joel Villanueva, Rep. Manny Pacquiao, Rep. Risa Hontiveros, Rep. Sherwin Gatchalian, and former Justice Secretary Leila de Lima. As one can see, the five neophyte senators are not entirely new in the political arena. All of them have experience in public service and all of them have specific plans laid out in what they will do or support as policymakers of the land. Villanueva said that this early, he has 50 bills already prepared. The bills focus on job generation and education. Pacquiao's first bill will prioritize free education. Gatchalian will push for the same agenda, planning to file a bill that will ensure free higher education in all State Universities and Colleges. Hontiveros will focus on universal health care while De Lima will prioritize reforms in the criminal justice system. She also vows to fight corruption. The new senators are also open to the idea of federalism being proposed by incoming president Rodrigo Duterte. But when it comes to the reimposition of death penalty, not all of them are in agreement with him. Villanueva, Pacquiao, and Gatchalian are for death penalty while Hontiveros and De Lima are opposed to its reimposition. Aside from the neophytes, the other winners in the senatorial race were reelectionists Sen. Franklin Drilon, Sen. Ralph Recto, and Sen. Vicente Sotto III. Former senators Panfilo Lacson, Richard Gordon, Juan Miguel Zubiri and Francis Pangilinan were also proclaimed as winners. With the new incoming administration, expect a re-alignment of influence and affiliations in the Senate when the 17th Congress opens in July. The questions foremost in anyone's mind now is, how many allies does Duterte have in the Senate? And can his allies get the majority bloc? Who will emerge as the new Senate President?